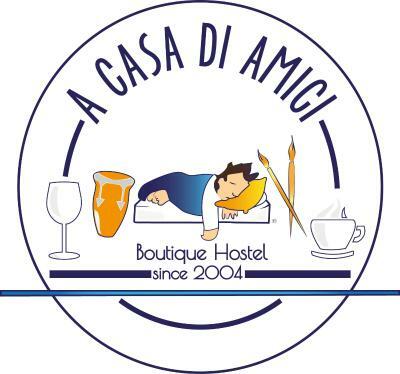 Lock in a great price for A casa di Amici - Boutique Hostel – rated 9 by recent guests! Great staff - very helpful and knowledgeable about Palermo. Lived the bar, the vibe and the way the hostel was decorated. Great location. Staff was awesome and super helpful! They helped us map out our days, and even made reservations for us. The showers were warm, and the kitchen was big/had a lot of appliances. Such a fun place to stay! They have different things happening during the days and evenings, the staff are very kind, funny, helpful and warm to all their guests, if they're doing something they make sure to invite you (like Italian cooking class!). They had a drum circle jam session one night and invite everyone there to play, even if you're not musically inclined, and it's a ton of fun! Decent breakfast, great kitchen and patio, lots of spaces to chill if you want and the bathroom is pretty nice with hot showers! Well located to walk around to some major attractions and close to the airport shuttle stop, the train station is about 30min walk from there. Also cool that it's family friendly so you get a wide mix of travellers from all ages and backgrounds. Great experience, good atmosphere, and kind staff. Friendly cozy environment, highly recommended for those traveling alone. Alessandro and Alessandra were particularly helpful staff. Amazing place to stay! Plenty of friendly solo travellers, combined with the amazing Santo and Christopher who run the hostel and host regular jamming sessions! One of the top hostels ive stayed in. The first night there the owner made dinner for the guests who were at the hostel at no charge to us. Breakfast had fresh baked croissants, cereal, juice, tea, and coffee. There were plenty of places to eat near the hostel and there is also a kitchen there if you prefer to cook for yourself. 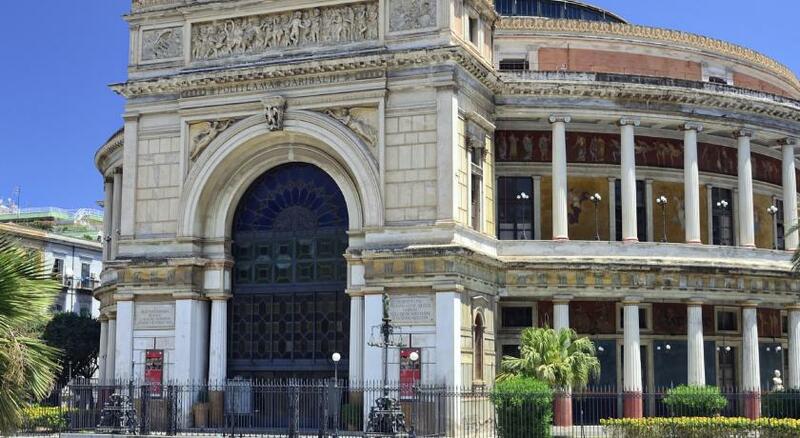 Everything that there is to see in Palermo is within walking distance of the hostel. The outdoor sitting area is a great place to meet other travelers staying at the hostel and if you're lucky you'll get a free concert from the staff and any one staying at the hostel who can play an instrument. There are places to sit inside as well. 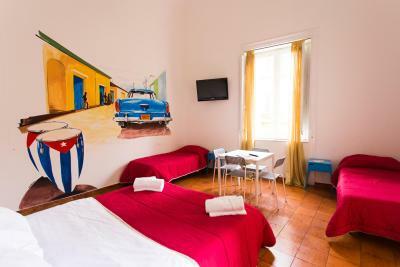 The hostel has information on the buses if you need to plan travel within or outside Palermo. The property was also very clean. Overall, a great place to stay. I only booked this to have a place to put my bags during the day. I didn't actually sleep here. One of our best sellers in Palermo! 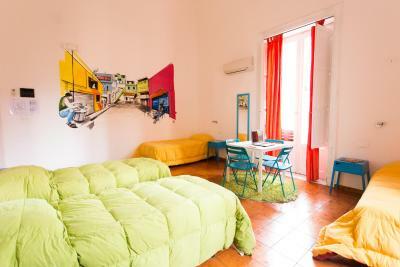 Offering both rooms with attached bathroom and beds in shared dormitories, A casa di Amici is located in the center of Palermo. Guests can enjoy a bar on the terrace and a 24-hour front desk. Each unit at this hostel features air conditioning and WiFi. 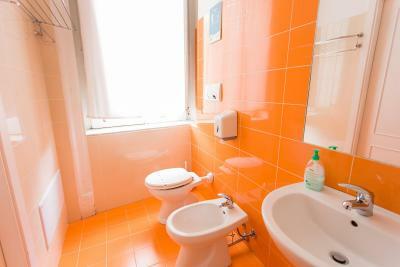 Rooms come with a private bathroom fitted with a shower and equipped with a hairdryer and free toiletries. 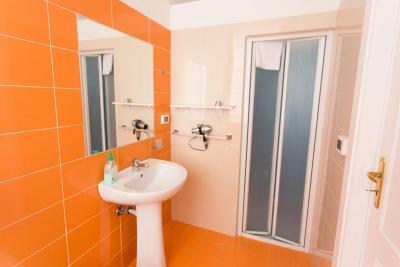 Dormitories offer a locker, power outlet and private light, and a shared bathroom. You will enjoy a characteristic Italian breakfast daily. 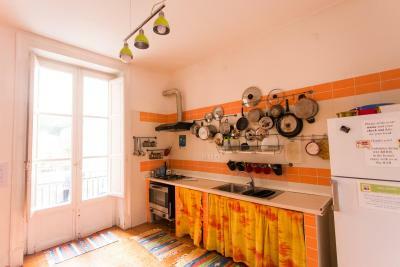 It includes hot drinks, croissants and pastries.A shared kitchen is also available. 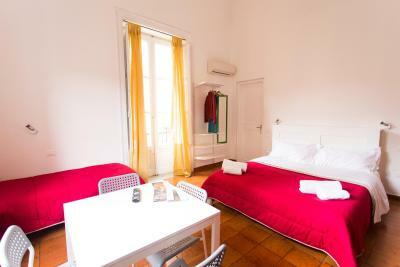 A casa di Amici is a 10-minute drive from Palermo Train Station. Palermo Cathedral is 0.6 mi away. Bus stop to the Airport 1,000 feet away. 뀐 Located in the top-rated area in Palermo, this property has an excellent location score of 9.0! 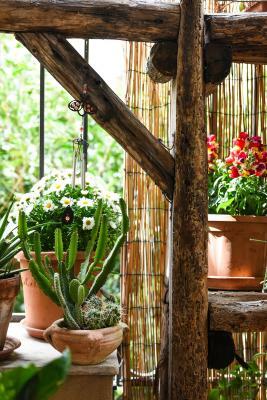 When would you like to stay at A casa di Amici - Boutique Hostel? With free WiFi, this individually decorated room features air conditioning and table and chairs. The private bathroom is complete with a hairdryer and a shower. Featuring a spacious living area with 2 sofas, this air-conditioned suite comes with balcony and free WiFi. The private bathroom comes with a large shower and hairdryer. With free WiFi and air conditioning. It features a locker, power outlet and private light. The bathroom is shared. This bed in a 4-bed mixed air-conditioned dormitory room comes with free WiFi, a seating area and shared bathroom. This air-conditioned room comes with free WiFi, a seating area and shared bathroom. The lobby with the reception open 24h immediately denotes our character: it seems to be in a contemporary art gallery! Drawings left by our guests , hand drums created from Santo Vitale and other musical instruments - on the walls , and available to anyone who wants to use them for playing - and then sculptures , books , pallets and lots of color ! Everything has been created and studied by following the eco-design taste. If you want to relax or have fun we invite you to our bar open 24 hours a day . At your disposal board games , PlayStation , books , musical instruments , piano , drums and guitar , and a small cinema . 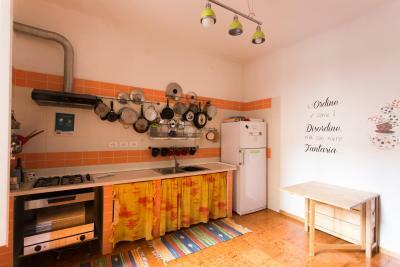 House Rules A casa di Amici - Boutique Hostel takes special requests – add in the next step! ATM card A casa di Amici - Boutique Hostel accepts these cards and reserves the right to temporarily hold an amount prior to arrival. A casa di Amici - Boutique Hostel accepts these cards and reserves the right to temporarily hold an amount prior to arrival. Please inform A casa di Amici - Boutique Hostel of your expected arrival time in advance. You can use the Special Requests box when booking, or contact the property directly using the contact details in your confirmation. The only less good thing that I can mention is that my room was pretty noisy and you could hear the cars from the street. So someone who has a light sleep may struggle. However it might have been only my room. The hostel is very central and close to everything. The common areas as well as the atmosphere are cozy and comfortable. They also organise social dinners that help you getting to know new people and making friends. The staff is super kind and available to help. The room had a slightly bad smell, but I think that was the fault of another guest and not the hostel. Bit of street noise in the room but fine with ear plugs. Croissants for breakfast was a lovely surprise! Room was really large and kitchen big and clean. 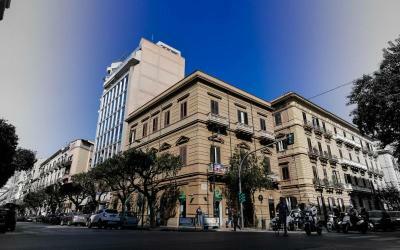 The host is in the centre of Palermo, close to main points of the city. The staff was amazing. The other guests always welcoming everyone. It was one of the best experiences in my life. A little noisy but not a big issue - it was quiet at night which is all that really matters. It was a little loud at night, and could hear from the outside, but can’t complain otherwise! Central location. Very helpful staff. I loved the wednesday night pasta and music jam! Our room was above a central street so we could hear the cars honk even during the night. Great ambience, staff, breakfast, location--everything! It was friendly, colourful art every where. Loved the communal kitchen and dining room. A great vibe. Staff were terrific, helpful and happy. 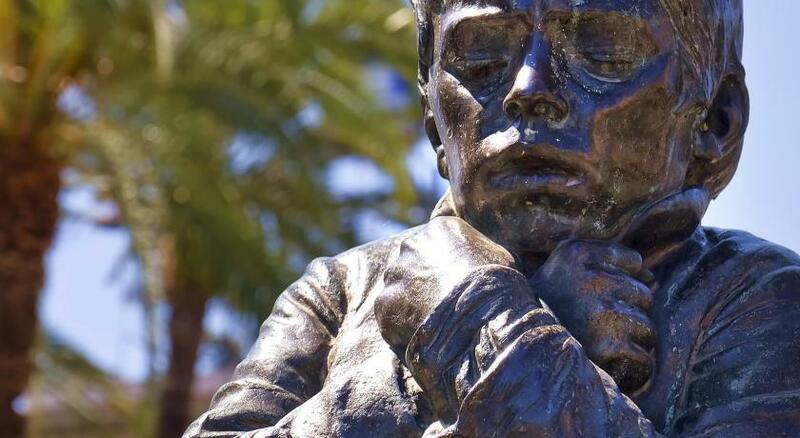 A great place to meet fellow travellers from all corners of the earth. Everything was super nice, but after sleeping on that bed I woke up with a lot of bug bites, at least 14 on one hand and more than 20 on my back. It was very clean and the staff were very friendly. Note the breakfast is basic but that's okay. It was a tad loud as I stayed at the front of the building but the room was great. Thank you!